The learning of knowledge and techniques is done through practice in classrooms. The theory is integrated into the practice, allowing a better understanding of the techniques and immediate implementation. Flexible offer that allows following a 25-consecutive week course, or separately certified modules. The aim of this training is to allow students to learn the basics of cookery and to master the creation of the basic elements. Make basic recipes: sauces, vinaigrettes, mayonnaises, stocks, etc. Make basic starters: soups, quiches, salads, etc. Make fish and seafood dishes: moules marinières, whiting à l’Anglaise, sole bonne-femme, etc. Make meat dishes: roast poultry, sautéed veal, beef stew, stews, grilled meat, etc. Make classic desserts: fruit tarts, filled choux buns, layered desserts, moka, bavarois, etc. 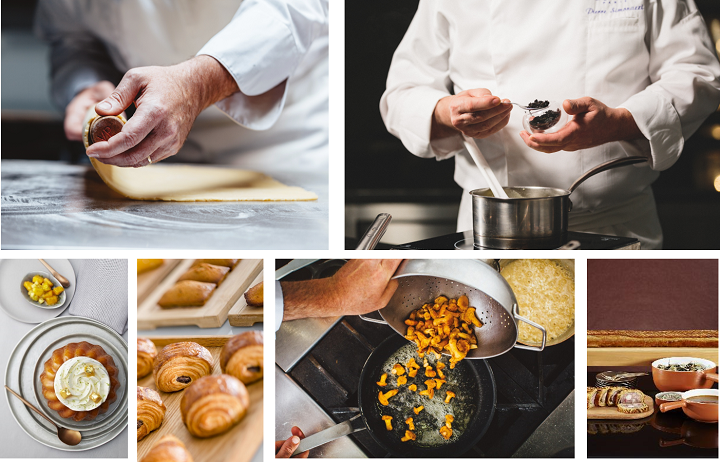 The objective of this training is to allow students to deepen their knowledge of cooking and to master the techniques necessary to achieve the basics of pastry catering. Master seafood and shellfish recipes: tartare or carpaccio, oysters in gelée, marinières, stuffed clams, crayfish, lobster, etc. Master cold and hot starters: soufflés, flaky fingers, salads, etc. Master the basics of pastry catering: basic pastries and how to use them, cooked fruit, petits fours, pastry creams, dry and soft petits fours, etc. 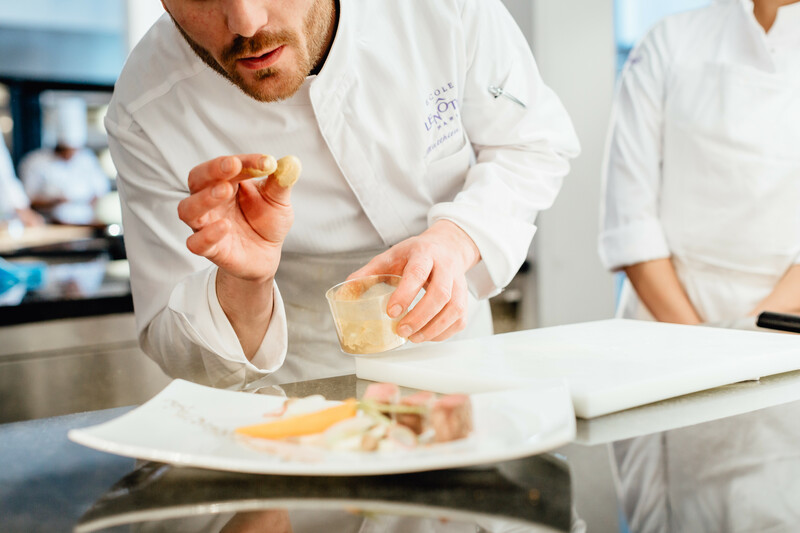 The aim of this training is to allow students to consolidate their mastery and perfect the skills necessary to work in the profession of a chef. Of which 2 weeks are led by a MOF chef. 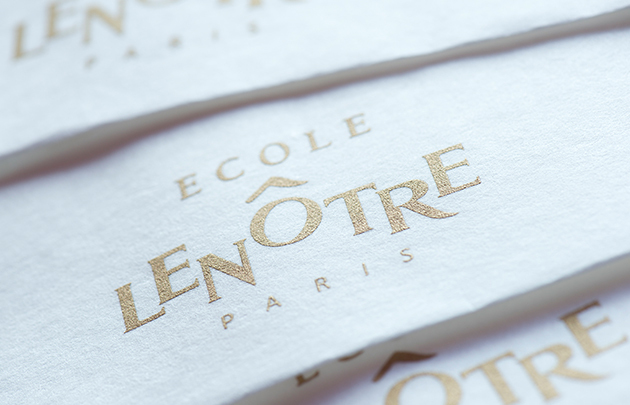 On the successful passing of exams, students will receive the Certificate of Chef Ecole Lenôtre (Certificat currently being validated with the RNCP). +4 weeks (minimum) of intership inside Lenôtre's workshops or in places selected by Ecole Lenôtre. Given the limited number of seats in each session (12 maximum), we advise you to register at least 3 months before the starting date of your course. ​The Essential Certificate: 9 720€ tax inclu. The Inescapable Certificate: 11 340€ tax inclu. The Mastery Certificate: 14 880€ tax inclu.